Expected frequency of use of social media communication methods in the near future. Social media consumption habits of online U.S. adults when communicating with certain people. Popularity of social media communication among online U.S. adults if they could only choose one method to communicate with certain people. Perhaps unsurprisingly, women have been revealed as being more social than men overall, with women being 68% more likely to use social networking or media to communicate with friends other than in-person. 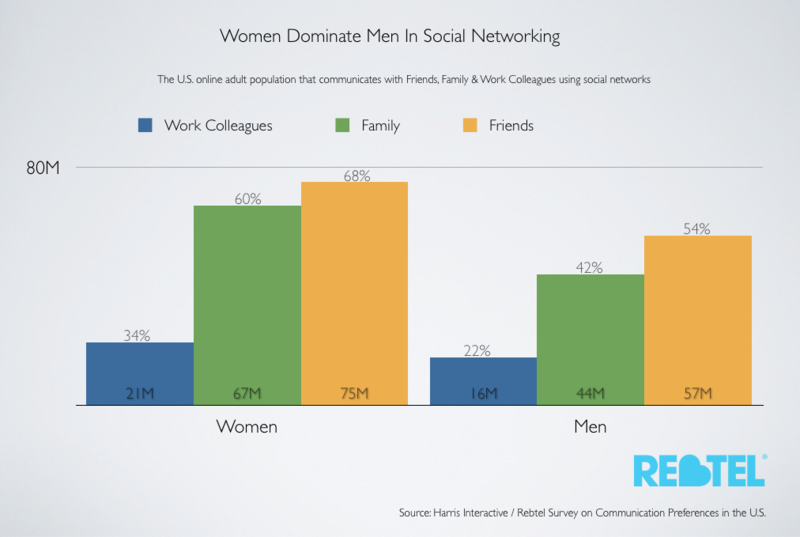 Assuming that those surveyed also represent the much-larger U.S. population, that’s 75 Million women communicating with friends via social networks vs. 57 Million men. In the case of communicating with family or work colleagues via social media, women again dominate at a whopping 60% for family and 34% for colleagues, with men only at 42% for family and a measly 22% for co-workers. The study shows that women, in general, tend to trump men when it comes to media consumption and communication online. There is one area, however, where men actually do manage to take a short lead, and that is with voice/telephone communication. The math in the following graphic seems a little off when first glancing at the percentage of women and men versus the actual population number, but this can easily be explained. Out of the 235 million adults living in America, 119 Million are women and 116 Million are men, while 24% of the population is less than 18 years old (numbers based on a 2010 U.S. Census). So in terms of who is actually being included in the survey, women outnumber men in general, not just in the way they choose to communicate and with who. 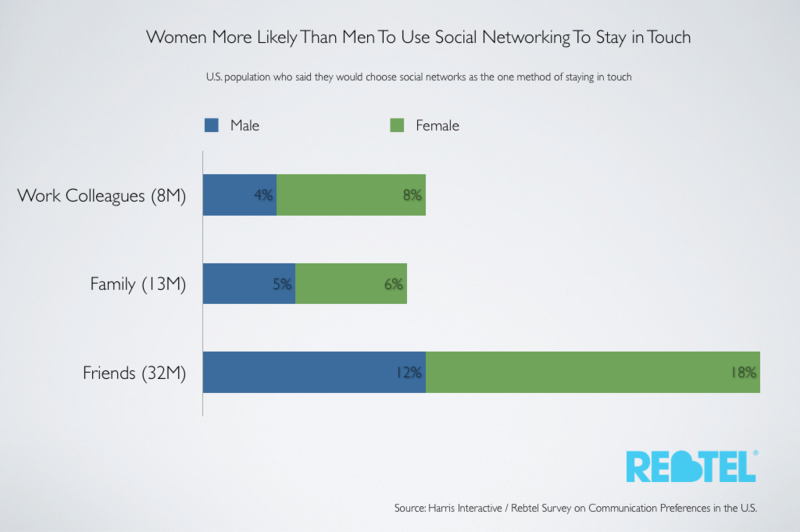 This study doesn’t fully conclude that there are more women than men actually using social media overall. Rather, it communicates a preference among the two opposites for what medium they choose to communicate through and who they choose to do that communicating with. Purely out of curiosity, we’d like to conduct a small sample survey of our own. Weigh in below with: Do you agree with the survey above? 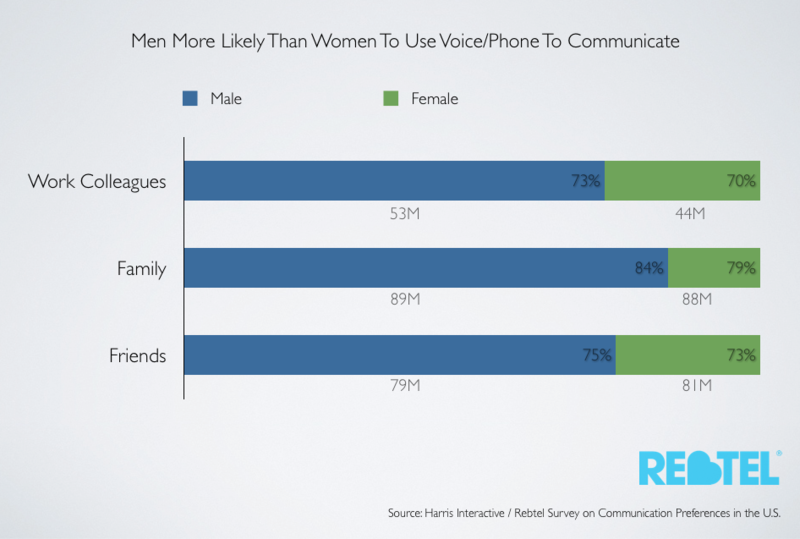 And as a male or female, what medium would you choose to communicate with for each of the three categories: work colleagues, friends, or family?